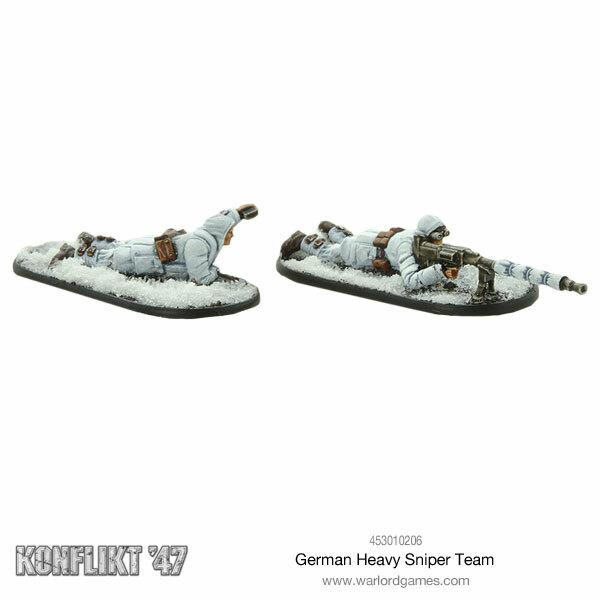 Warlord Games has released some new German units for their alternative history miniature game Konflikt ’47! Ready to bust even the thickest of bunkers is the Thor heavy panzermech, lumbering over the battlefield with its massive howitzer. 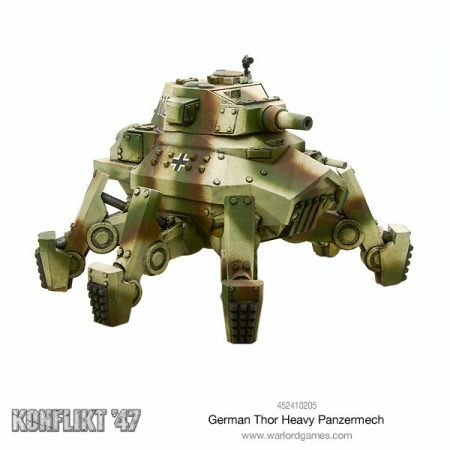 The Thor panzermech is designed to enter the toughest urban environments and deal with entrenched infantry. Well armoured and armed it does its job far too well for most opponent’s liking. With all the new armoured machines and genetic creatures walking the war-torn world, Germany has stepped up its Anti-Tank game with the new German Heavy Sniper Team. With the advent of heavy armour and light walkers on the battlefield, the role and relevance of heavy anti-tank rifles have been revised. Never intended to take on heavy vehicles, they are perfect for tackling scout walkers and the new breed of heavy infantry. This blister pack contains a detailed metal heavy sniper team consisting of an anti-tank rifleman and their spotter.